Note: These muffins can also be made with Nuchia Foods Gluten Free Chia Seed Flour using the substitutions below. These muffins are delicious, easy to make and great for you. Enjoy them hot out of the oven and keep extra for lunchtime snacks for the kids (or you) during the week. Pumpkin is loaded with an important antioxidant, beta-carotene. Beta-carotene is one of the plant carotenoids converted to vitamin A in the body. In the conversion to vitamin A, beta carotene performs many important functions in overall health. Current studies link diets rich in foods with beta-carotene to reducing the risk of certain types of cancer and protection against heart disease. Chia seeds can be found at some health food stores. Fold the wet ingredients (fold in nuts now if you are using them) into the dry ingredients and spoon into paper-lined muffin or greased muffin tins. Bake for 25–30 minutes or until a toothpick inserted into the middle of a muffin comes out clean. Store completely cooled muffins in sealable plastic bags in the freezer. If you are trying to increase the fiber in your diet, you might want to consider steadily building up your intake rather than quickly ramping it up—otherwise, you could find yourself running for the bathroom. "You can't go from the average in America of 10 to 12 grams of fiber to the 25 grams that a woman needs or the 35 that a male needs just like that. 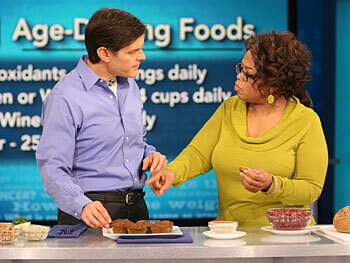 It's just too much all at once," Dr. Oz says. "Remember there are more bacteria in your intestines than there are cells in your body, so there are a lot of guys in there, and they're just trying to metabolize the food. So you give them a lot of fiber all at once, they're going to make a lot of gas out of it." One intestinally gentle way to increase your fiber is by adding psyllium husks to your food. "If you're having a lot of foods like beans, you can add just a little bit of something called Beano. There are other products like it, but they provide enzymes—natural enzymes—that help your body get rid of some of the gaseous elements." Another way to offset the gaseous side effects of a dramatic increase in fiber, Dr. Oz says, is by eating a Peruvian whole grain seed called chia—which is the same grain used to make Chia Pets—though you obviously shouldn't eat a Chia Pet. Chia is as chockfull of fiber as other whole grains, but it packs in even more vitamins. "Remember that broccoli I had before? [One of these muffins] has more magnesium than about 10 of those heads of broccoli, and it's got as much calcium in it as a couple cups of milk," Dr. Oz says. "It adds one other thing, too, by the way. It's very rich in the next big category, which are omega-3 fatty acids."